Illinois State Geological Survey has great stuff on their website, but some of it like the highest and lowest points in Illinois by County is nearly impossible to find from their home page. On the other hand, their phone order service for publications and maps is among the best in the world. Call 217-333-4747 from 9-5 local time. Illinois Geology Interactive Map roll your mouse over the state and click. History of the Hillside, Illinois rock quarry from their library. History of the Thornton Quarry. Chicago Links for Chicago Geology information and links. Illinois State Museum. quaternary deposits of Illinois, glaciers in Illinois, and glacial retreat models from their GIS lab. Illinois State Geological Survey's recently redone glacial information home page with updated links and information including: ISGS publication on the web "Pleistocene Glaciations in Illinois.". Illinois State Museum Map Laboratory - click on "Glacial Retreat Map" to watch a movie of the extent of Wisconsinan glaciation, and how it melted. Chicago Public Library provides a list of their collections which deal with glaciers in Chicago. 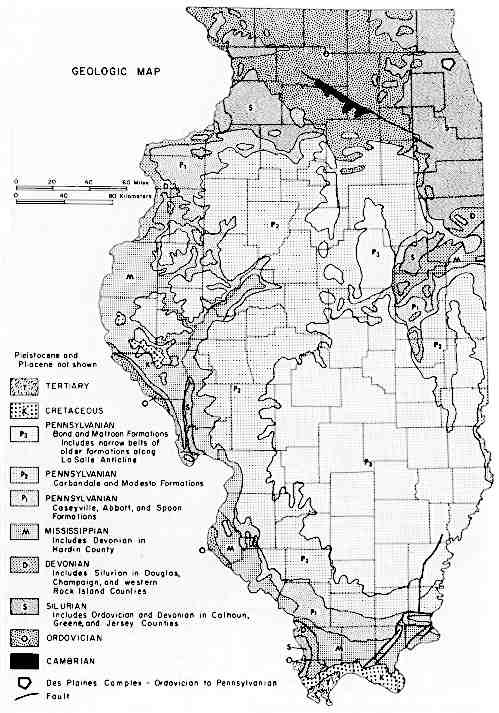 Illinois State Natural History Survey provides a map of glacial boundaries in Illinois, and dates of Illinois' glaciations. The 5 Great Lakes. Gifts of the Glaciers. Openlands. Midewin Prairie - click on timeline. The Amphibians and Reptiles of Illinois from state herpetologist Chris Phillips. Click on a county to get a list of species for which vouchered specimens are known. Central Illinois Herpetological Society. Pictures, links and resources for Illinois' herpetologists. Chicago Herpetological Society has a section on the Herps of Illinois. State of Illinois home page with links to state science agencies and museums. Illinois Department of Transportation provides a cute highway closing map useful in snowstorms and heavy traffic days. Illinois Environmental Protection Agency home page. Illinois Pollution Control Board Use their form to report pollution events and polluters - 24 hours a day.